For the novel, see The Moon Pool. 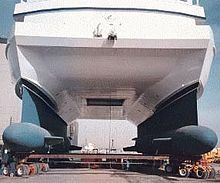 Underside of the Research Vessel Western Flyer, showing its moon pool between the two hulls. A moon pool is a feature of marine drilling platforms, drillships and diving support vessels, some marine research and underwater exploration or research vessels, and underwater habitats, in which it is also known as a wet porch. 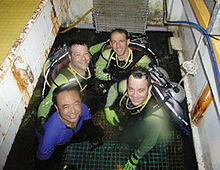 It is an opening in the floor or base of the hull, platform, or chamber giving access to the water below, allowing technicians or researchers to lower tools and instruments into the sea. It provides shelter and protection so that even if the ship is in high seas or surrounded by ice, researchers can work in comfort rather than on a deck exposed to the elements. A moon pool also allows divers or small submersible craft to enter or leave the water easily and in a more protected environment. Moon pools can be used in chambers below sea level, especially for the use of scuba divers, and their design requires more complex consideration of air and water pressure acting on the moon pool surface. Moon pools originated in the oil drilling industry, which uses them in drilling at sea or in lakes, to pass drilling equipment into the water from a platform or drillship. Drill pipes need to run vertically through the structure or hull and the moon pool provides the means to do this. Very deep moon pools are used in underwater habitats—submerged chambers used by divers engaged in underwater research, exploration, marine salvage, and recreation. In this case, shown in part D of the diagram, there is no dry access between the chamber and the sea surface, and the moon pool is the only entry or exit to the chamber. Submerged chambers provide dry areas for work and rest without the need to ascend to the surface. This kind of submerged chamber uses the same principles as the diving bell, except they are fixed to the seafloor, and may be called a wet porch, wet room, or wet bell. Sometimes the term moon pool is used to mean the complete chamber, not just the opening in the bottom and the air–water interface. The alternative to a moon pool in an underwater habitat is the lock-out chamber, which is essentially like a fixed submarine, maintaining internal air pressures lower than ambient sea pressure down to 1 atmosphere, with an airlock to enable entry and exit underwater. Underwater habitats may have connected chambers with moon pools and lock-out chambers. ^ Oilfield Glossary: "Moon Pool'. Schlumberger website, retrieved 17 July 2007. ^ Gregory Stone: "Deep Science". National Geographic Online Extra (Sept 2003). Retrieved 29 July 2007. ^ US Navy: Naval Undersea Museum SEALAB page Archived 2004-12-15 at the Wayback Machine, retrieved 1 August 2007. ^ "Aquarius Undersea Laboratory". Retrieved 12 September 2018.